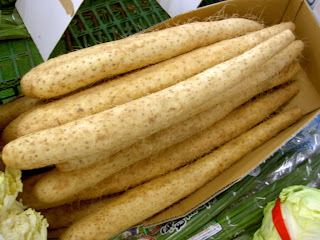 Tororo-imo is Dioscorea opposita (yam) or a kind of potato. We also call it Naga-imo. 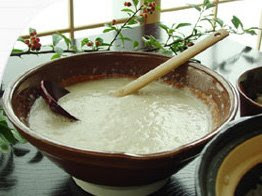 Japanese people love sticky foods and know a lot of ways to prepare Tororo-imo. It is good with sake! Grated Tororo-imo, is most popular way to eat it. or put the mixture on steamed rice. Peel skin and cut into quarter inch thick, 2 inch lengths. Top with katsuobushi (dried bonito flakes) and soy sauce. Cut into 1/4 or 1/2 inch wide slices. Put them and butter into a pan with medium flame. Japanese love to put grated Tororo on all kinds of noodle-. 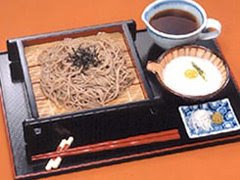 soba, udon, zaru-soba, zaru-udon, kaki-soba, yaki-udon. 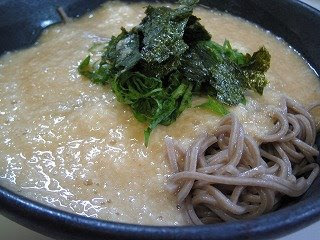 We have many other dishes we use with tororo-imo. 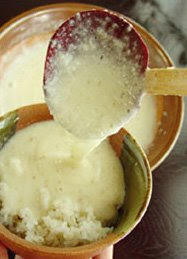 If you find “tororo” word or white sticky paste in a Japanese restaurant, please try it. It can be found at Asian grocery stores in the US. Your recipe is perfect, especially, using Miso! I did not know that. I will try it. Friend of mine told me he adds cooked ell into grind totoro imo. You know frozen cooked ell is sold at Japanese store. It is very easy handling. It took me over two years to find out what this sticky, slimy and in my opinion tasteless "thing" , which was sometimes put over my rice or noodles, is. Whenever I descibed it to my japanese colleguages they didn't know what I meant. Last time I've bought a pack of soba-noodles ready to eat in the supermarket - and there it was again --- thanks god packed seperately--- tororoimo. Finally I could show it to my colleguages and now they understood what I always have tried to explain! Now with your help I could learn more about it and I have now written in japanese a card which says "I don't like tororoimo, please serve it without it". This will make my order in restaurants much easier, because it was always a lot of work to fish tororo out of the soup or remove it from the rice! Thank you from an absolut japanese food lover - besides toroimo! sorry, I just noticed I mixed up the letters of your name in my comment before. Hοwԁy! Do уоu uѕе Τwіtter? enjoying уour blog anԁ lοοk forwarԁ tо nеw postѕ.